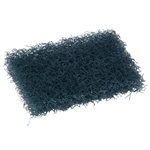 We provide the best restaurant supplies including stainless pot scrubbers and scouring pads for cleaning dishes. A stainless steel scrubber works great to clean pots and pans after a busy night of cooking. 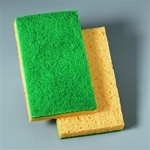 Most homes in America have a scouring pad or brillo pad in their kitchen sink. Never run out of scrubbers and cleaning pads through wholesale bulk purchasing. 3M Dobie White Cleaning Pad 4.375 in. x 2.69 in. x 0.56 in. 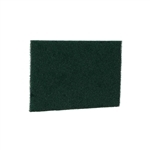 3M Scotch-Brite Heavy Duty Green Scouring Pad 6 in. x 9 in. 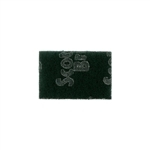 3M Scotch-Brite Purple Scour Pad 2.8 in. x 4.5 in. 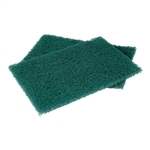 3M Scotch-Brite 105 General Purpose Scouring Pad Green - 4.5 in. x 6 in. 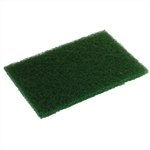 General Purpose Scotch Brite Scouring Pad - 6 in. x 9 in. Have you ever encountered some stains and food residue that was too difficult to remove from your dinnerware and cutlery, even after a pressured wash and hard labor scrubbing? Thank god for heavy duty scrubbers. Using heavy duty scrubbers and pads will ease the dishwashing process while enhancing your back kitchen productivity. With more time on your hands, after saving the wasted time from noneffective scrubbing, your employees will be able to use that time for other important daily restaurant tasks. 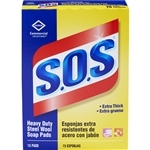 Round Eye Supply carries a wide assortment of pads and scrubbers. Browsing through out selection of top notch quality scrubbers and pads. Rely on our premium products to clean. Start shopping and save today. Buy your Scrubbers and Pads from the leader in commercial restaurant supply.